Some time ago, Stu Percival had a grand idea. Last weekend,his idea became a reality; Strollers ran the wall, all of it, in just over 18 hours. This adventure started on the Friday night at 10pm. Luckily the rain stopped bouncing just minutes before the start but Solway locals still peered out of the pub window in wonderment at such folly. Due to rubbish sat nav signal, the kettle boiled just in time as the runners reached CP1. This was a sad point; Stu had wanted to run the whole wall but he realised his injury was still injured and had to stop. Unfazed, Dan, Pete and Harry had a drink and a snack and off they went on leg 2. Hasina, Ant and Shaun took a break and Terry and Mal headed home. Well done this bunch for dipping in and out for the duration of the journey. Running continued through the night and not even staring cows, cold and drizzle could dampen our spirits. The Maynards rocked up to join in the fun from CP3, taking us into daylight. With cat naps barely snatched, the runners ran on, the drivers kept driving and the kettle kept boiling. 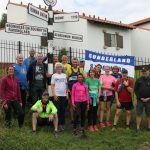 At 9:30 a fresh batch of runners were collected from Sunderland – Jill Sardine had also joined in by now -and driven up in time to eat tray bakes. Aly, Jo, Brian and Lee brought their fresh legs and Jill C took over the kettle. Val travelled to the Quayside and the whole running crew ran the last leg to Wallsend. Target time was 18 hours and, in spite of the efforts of some very mean cows, this was pretty much what was achieved. Stuart, thanks for the idea and the meticulous planning. Thanks to our drivers, Ian and Phil – well done for staying awake! And thanks to every single one of you who got involved, it was FUN!